Jo Ann, wife of Bob F. Hill, Broker was born in Atlantic City, NJ and raised in Vineland, NJ. Prior to her marriage to Bob Hill she traveled with American Airlines as a Flight Attendant for several years living in Minneapolis, MN, Chicago, IL, Dallas, TX and New York City, NY. After her marriage to Bob she spent the next several years raising their 3 children with Bob, moving in the corporate world from Murfreesboro, NC to Raleigh, NC ……Florence, SC…….Annapolis, MD…..Lawrenceville, GA……and then in the real estate world from Toccoa, Ga……finally settling in Seneca, SC that has been her and Bob’s home for the last 14 years. While following Bob in the corporate world she served as an Administrator in the dental and medical fields during those years. 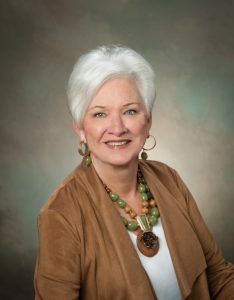 In 1998 she joined the staff of Bob Hill Realty as Administrator and Partner. From 1998 till present, JoAnn has worked in the dual role of administration and licensed assistant. In 2010 and 2011 JoAnn volunteered as a Northside Elementary Coach for their 26K run and actually placed 3rd in her age division in 2010. Four of her grandchildren attended Northside Elementary at the time. This is a Healthquest program designed to encourage our children to be healthy and to keep moving.